I was able to learn a lot from this speech. I always look forward to hear his words and thoughts, they convey a very deep meaning. Thank you for this wonderful interview. Soul stirring talk, only Gurudev can give us the highest knowledge, in such simple words and make our lives so playful, when I listen to HIS talk I feel the expansion in my life, feel connected to one and all. Guruji is one who came to change this world and make it lovable,enjoyable for all.What we can do is to join him to contribute. The efforts by AOL, Has brought Peace in many people, Guruji is the one of deserved person who Shoud get the nobel prize for peace. Keep it up, very very good, Thanks to Electric Sky for the broadcast.I feel this is great channel to pass the preaching of Guruji to thousands of people in North America. Thanks a lot electric sky…you really can give us things that make us spellbound…thanks Mark ! For all those on this page who’d like to listen to more talks by guruji…do watch Dialogues with Sri Sri Ravi Shankar to be aired on CNBC TV 18 ( India) from the 25th of Nov onwards…7:30 pm (India time). i was fortunate to listen to what guruji said, if this type of speeches are published it will be good not only for me but to thousands of people, who are unable to attend the program or listen to guruji. Amazing interview.I am able know how guruji managed silver jubilee function with out any traffic jams or any other incidents. No words to discribe about Guruji The living god for the entire mankind. well done sky ! Do more such things! I WANT TO TALK TO YOU BUT HOW?????????? IT IS A BETTER EXPERIENCE TO LIVE IN THE PRESENT! very inspiring and energetic to the soul. I am very excited with this recording. Brilliant interview! Thanks to Electric sky for making this facility available. Everybody should go for the Art Of Living courses. Those are designed by Him, especially for you. Try to contribute to the world in the way you can. hi this is yogesh here i am very thankful to the site.really great talk by guruji.i love u guruji.i belong to u and the whole world. “relate with each other with heart, sincerity and love” GuruJi certainly enables people to achieve this lofty goal and suffuses life with joy. It is indeed a different feeling to here Guruji’s voice again again. I havnt attended any of Guruji’s class, my aunty use to attend all the classes and heared about his holiness and works. I belive him a lot and trying to attend his class but couldn. He is Next to God and a DOWN TO EARTH person…. Anyone please help me in finding guruji songs or videos.. I agree AOL [moderator: Art of Living] is doing wonderful job in reducing the stress levels of the rich people in the world . But the courses are too expensive. There is not any place for the economically weak people in the AOL. So, I see ‘Guruji’ just as a reincarnation of Rajneesh, who was the ‘God of Rich’. I see AOL as more like a well marketed business organisation, rather than a spiritual organisation. Jai gurudev. I am a public sector employee and at present working in BHEL/Jhansi and trying transfer for last 10 years but all efforts are in vain. Will you please help me in this regard. IT is enlighting knowledge to hear Gurujis words. I would like to comment, on Mr.VJS raghavan’s Qn. Once we ar econtented with what we have and where we are, we can fulfill our wiahes.Start loving your Job and place of work, things will automatically happen.If possible do AOL part 1 , course and see the difference of accepting People and situation. Dear Guruji, My first book that i have read is Celebrating Silence, Even the small things about life is beatifullt explained….I like that book very much, it has changed the way i thought, i have become more positive..Thanks for everthing. life is a dream,if you are not wokeup. i have queries about my life.how do i approach guruji to answer them? Our hope to future are people like Guruji. I’am very lucky to be born in this part of this world. If we can awaken the God within all of us ……that is His mission. i want to join art of living ….in delhi but how?? 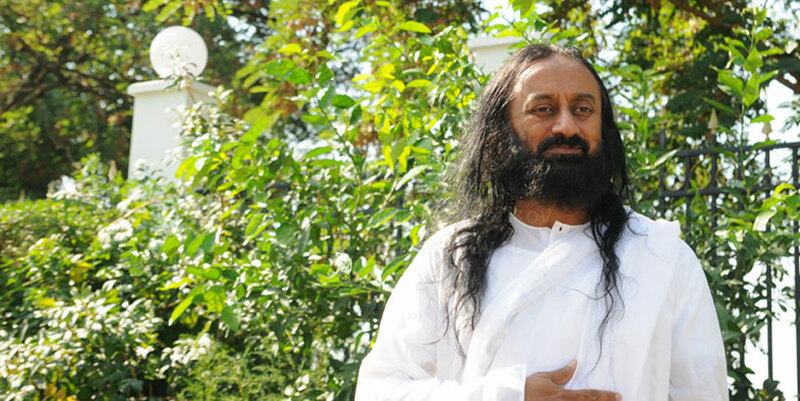 Sri Sri Ravi shankar guruji is a great man..and he is the need of the need of the hour..he is so inspiring……..